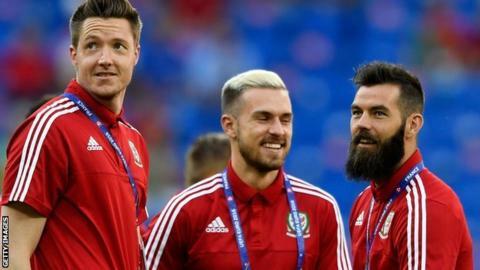 Wales have injury worries over keeper Wayne Hennessey and midfielder Joe Ledley for their opening 2018 World Cup qualifier with Moldova on 5 September. Crystal Palace boss Alan Pardew admits the Welsh pair are "struggling a little bit" for their Premier League match with Bournemouth on Saturday. Wales are already without midfielders Aaron Ramsey (hamstring) and Jonny Williams (ankle) because of injury. Emyr Huws, Tom Lawrence and Paul Dummett return after missing Euro 2016. Nottingham Forest midfielder David Vaughan was not included in manager Chris Coleman's squad after retiring from international football. The 33-year-old, who was unused during Wales' Euro 2016 campaign, won 42 caps after making his Wales debut against the United States in 2003, scoring once. Ramsey, 25, suffered a hamstring strain while playing for Arsenal against Liverpool on the opening weekend of the Premier League season. Hal Robson-Kanu is a free agent after leaving Reading at the end of the 2015-16 season. Williams sustained an ankle injury in a pre-season game and has been ruled out for up to 10 weeks. "When you've got a player as good as Aaron, take him out of any team and you are going to know about it," Wales manager Chris Coleman said. "He is irreplaceable, he makes a huge impact for us. He is a great player and it's a shame he's not here. He's a loss to any team. "Jonny has had a good impact on the team and brings something different. I saw that tackle on him, it was a coward's tackle from behind, and that was annoying." Lawrence, who spent the second half of last season on loan at Cardiff City, returns to the squad after an ankle injury ruled him out of Euro 2016 contention. Striker Hal Robson-Kanu, who scored twice for Wales at Euro 2016, is included despite still being without a club since leaving Championship side Reading at the end of last season. Coleman was also asked about Chesterfield striker Ched Evans, who has scored four goals for the League One side following his return to football. "He's come back and scored a few goals for Chesterfield but he's going to have to do a bit more than that to get back into the fold," Coleman added. "He's got some players that are in front of him who, in his absence, have not done so badly." Hennessey (Crystal Palace), Ward (Liverpool - on loan at Huddersfield), Fon Williams (Inverness Caledonian Thistle), Davies (Tottenham), Chester (Aston Villa) Collins (West Ham), Gunter (Reading), Richards (Cardiff), Taylor (Swansea), Dummett (Newcastle), A Williams (Everton), Allen (Stoke), Edwards (Wolves), King (Leicester), Ledley (Crystal Palace), Huws (Cardiff), Lawrence (Leicester), G Williams (Fulham - on loan at MK Dons), Bale (Real Madrid), Church (MK Dons), Cotterill (Birmingham), Robson-Kanu (unattached), Vokes (Burnley).